Dozens of Israeli soldiers invaded, shortly after midnight, the courtyards of the Al-Aqsa Mosque, in occupied East Jerusalem, and assaulted hundreds of worshipers, wounding dozens, in addition to shooting 15 worshipers, including two who suffered serious wounds, and six medics, with rubber-coated steel bullets in the head, and abducted 120 worshipers. The invasion into the mosque started from al-Magharba Gate area, when the soldiers fired many firebombs, gas bombs, concussion grenades and rubber-coated steel bullets, to force the Palestinians out of the holy site. 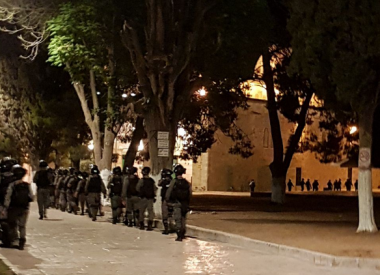 The soldiers then surrounded al-Qibli mosque, in Al-Aqsa compound, abducted 120 Palestinians, including two guards of Al-Aqsa, identified as Khaled Sharawna and Luay al-Qawasmi, and moved them to several detention and interrogation facilities. Medical sources said the Israeli attack led to dozens of injuries, including fifteen who were shot with rubber-coated steel bullets in their heads, and six medics. The soldiers also prevented dozens of medics from entering Al-Aqsa Mosque, and attacked many of them, before closing it to all Palestinians. The sources added that many Palestinians suffered serious injuries, two of them were rushed to al-Magharba Gate, and were moved to a hospital by an Israeli ambulance. The Maan News Agency said the soldiers confiscated the mobile phones from all the abducted Palestinians, in addition to abducting another Palestinian, identified as Mohammad Khader Abu al-Hummus, near Damascus Gate. The attack was the second in just a few hours, as the soldiers assaulted dozens of worshipers after evening prayers, Thursday, and fired dozens of gas bombs and concussion grenades, in addition to several live rounds, to remove the Palestinians out of the mosque, before shutting down all of its gates, and the Old City gates. The Israeli army and police also prevented all Palestinians males, below the age of fifty, from entering Jerusalem’s Old City. It is worth mentioning that various Palestinian figures, including national and religious leaders, are planning to hold an urgent meeting to discuss the renewed Israeli escalation, which comes hours after the army lifted the siege on the mosque, after the constant and persistent struggle to end the siege, which was violently reinstated ahead of Friday prayers. The situation in Jerusalem remains very tense, especially as the army pushed dozens of additional units around Al-Aqsa, and the Old City, in addition to installing dozens of roadblocks and deploying mounted units, preventing the Palestinians from approaching the holy site.